Emory University has been recognized as a top performer in the 2016 Sustainable Campus Index, achieving the ninth spot overall among research institutions. The 2016 Sustainable Campus Index, a publication of the Association for the Advancement of Sustainability in Higher Education (AASHE), highlights top-performing colleges and universities in 17 areas and overall by institution type, as measured by the Sustainability Tracking, Assessment & Rating System (STARS). Emory achieved top performer status by earning a high score in the Overall Top Performers subcategory in STARS. Emory’s Office of Sustainability Initiatives has a long-standing history of student, faculty and staff engagement, which encourages the entire Emory community to assist with sustainability efforts, says Ciannat Howett, director of Emory’s Office of Sustainability Initiatives. 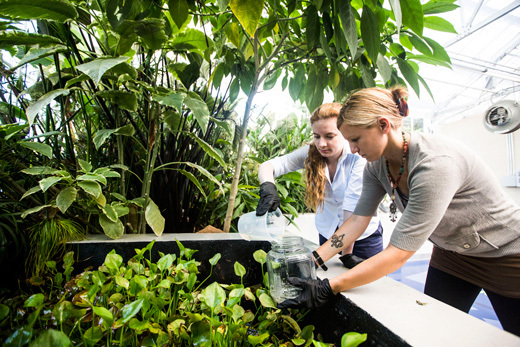 Since 2005, Emory has reduced campus energy use by 25 percent per square foot, added over 300 sustainability-related courses and built the WaterHub, a water reclamation facility that is the first of its kind in the nation. Among Tier I Association of American Universities (AAU) schools, Emory currently ranks third in the U.S. under AASHE’s STARS rating. Emory University’s STARS report is publicly available on the STARS website. Emory's report will be updated with version 2.1 in July 2017. The Sustainability Tracking, Assessment & Rating System (STARS) is a transparent, self-reporting framework for colleges and universities to measure their sustainability performance. STARS was developed by AASHE with broad participation from the higher education community. The credits included in STARS span the breadth of higher education sustainability and are organized into four categories: academics, engagement, operations, and planning and administration. All reports are publicly accessible on the STARS website. For more information, visit stars.aashe.org. AASHE empowers higher education faculty, staff and students to be effective change agents and drivers of sustainability innovation. AASHE enables members to translate information into action by offering essential resources and professional development to a diverse, engaged community of sustainability leaders. AASHE works with and for higher education to ensure that the world’s future leaders are motivated and equipped to solve sustainability challenges. For more information, visit www.aashe.org.